The e-learning courses enhance the capacity of local decision-makers to make the most efficient, effective and equitable use of investments in sanitation. E-Learning is a modern and flexible format of learning. Since 2003, «Distance-Learning» courses have been developed and implemented by GIZ to supplement regional f-2-f training for the water sector. Implementation with the Arab countries water association ACWUA and their members started in 2012. Since then, we have about 450 participants each year from 9 MENA countries who successfully completed 4 or 5 e-courses/year. We are applying interactive tools in a virtual learning environment to facilitate the learning process and enhance interaction among participants, trainers and e-tutors. The e-Learning courses are based on selected chapters of the «Water Impact Guidebook» for water utility management (eWUM) as well as on up-to-date approaches on good governance for urban sanitation (GOV) and for new sanitation systems and technologies (NUST). They are offered through ACWUA and their members (e.g. the HCWW in Egypt and the IEA/ONEE in Morocco) in English and partly in French. In addition, e-courses on Non-Revenue-Water were conducted during 2011-2012, based on the sourcebook Managing Non-Revenue-Water (GIZ 2010). Integrity and compliance are critical to good governance in managing water resources and providing water services to citizens. Therefore, ACWUA and GIZ in 2012 started a capacity development initiative by providing awareness seminars, training and advice, as well as developing tools and instructional materials (Water TAP Manual), with the aim of improving integrity in water and wastewater utilities in the MENA region. The action-oriented TAP (Transparency | Accountability | Participation) approach and method was successfully tested in pilot utilities in Tunisia, Morocco, Egypt and Jordan. Capacity development plays a crucial role in enhancing integrity and enabling anti-corruption principles to be put into practice toward more transparency, accountability and participation (TAP) with enhanced control of corruption risks and effective compliance management. Water supply and wastewater treatment are major energy consumers in all MENA countries, and hence, systematic efforts to optimize energy use contribute significantly to energy savings at national level and to reduce operating cost at utility level. Investing in energy efficiency would enable water utilities to expand and/or improve their services, to extend the lifetime of infrastructure and to contribute reducing Green House Gas emissions. The Energy Efficiency Task Force of ACWUA was established at the 6th Best Practice Conference in November 2013 in Algiers with some 15 energy experts delegated by ACWUA member utilities. The ACWUA WANT project assisted the task force (1) to develop guidelines for energy checks and energy analysis that guide the continuous process to optimize the use of energy in water and wastewater utilities, (2) to share international experiences on energy auditing and energy management systems, and (3) to publish a reader on good practices on energy efficiency already applied in water utilities in the MENA region. The new energy efficiency guidelines were tested during 2014-2015 in pilot utilities in Morocco, Tunisia and Jordan. Benchmarking is a management instrument to assist decision making at utility level. It aims for performance improvements through systematic search and adaptation of leading practices. These are continuously measured by key performance indicators. Water utilities in the MENA region are striving hard to improve their efficiency, quality of services and level of overall performance. Despite some differences in the legal status of water service providers and the institutional set-up of the water sector, the key challenges throughout the MENA region remain similar. Key performance indicators (KPI) for water supply and wastewater are a good instrument in helping to manage the utility. Well defined indicators can provide relevant information on important technical and managerial processes as well as on the corporate level. 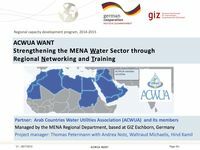 The ACWUA WANT project supports the ACWUA Technical Working Group «Benchmarking» to define such target hotspots KPI for the MENA region and to facilitate data collection, verification and analysis with pilot utilities. A licensed benchmarking online software tool is available to ACWUA to monitor and assess the indicators and to assist in decision making at utility level. The «Water Impact Guidebook» gives a step-by-step introduction to important issues to managing water utilities. The Impact Guidebook is intended to unlock the potential of people and organisations – our definition of Capacity Development. In four consecutive parts, 56 chapters give an outline of skills needed to successfully manage a water company and the infrastructure: (A) Enabling Environment, (B) Organization Development, (C) Human Behaviour and (D) Good Practices. The Impact Guidebook (GIZ 2012) was edited and reviewed by a group of some 25 practitioners and capacity development experts from the MENA region and Africa and contributes to the body of knowledge of how to establish, improve and maintain effective organisations in the water sector. The three e-Learning courses «eWUM are based on selected chapters of the Guidebook. TSM is a quality management system developed by the German Water Associations DWA and DVGW to support water utilities in meeting their regulatory obligations in «Technical Safety Management». It aims to fill the gap between laws, standards and codes and in the implementation of standard operation or maintenance procedures. TSM was adapted by the HCWW in Egypt, with support from GIZ and DWA, towards a more holistic «Total Sustainable System» to guide and enable managers to reach conformity with national regulations, laws and operation requirements in water and wastewater utilities. In 2013, the new ACWUA Task Force «Quality Management Systems» decided to adapt and disseminate the well-established TSM-Egypt system and TSM-inspectors training in Egypt to other ACWUA members, under the name TSM-Arab. The ACWUA WANT project supported the adaptation of TSM-requirements for water supply and waste treatment facilities. The TSM-Arab was tested successfully in ACWUA member utilities in Tunisia and Jordan, with the technical assistance of the HCWW of Egypt. The ACWUA WANT and its predecessor MENA WANT project were implemented from January 2010 to March 2016. ACWUA and their partners (among others ONEE/IEA and HCWW) are now managing the capacity development activities and applying the products on their own. We refer to their websites.